Interpneu Handelsgesellschaft mbH is the tyre and wheel wholesaler for commercial customers (tyre and wheel service operations, car parts, automotive trade and related forms of business). The free customer registration gives you access to our online dealer shop so that you can make queries concerning our stocks of tyres and wheels, place orders, and find out about other service options. Download the registration form to make a new registration, fill it out and send it back to us by fax together with a copy of your business registration. 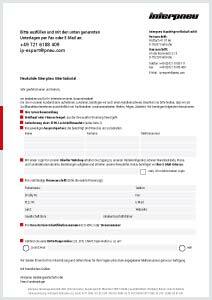 You can get the form for registration as a new Interpneu customer and the SEPA bank transfer payment from the Download page on our Website. 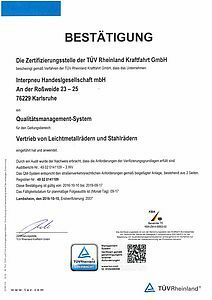 Interpneu Handelsgesellschaft mbH makes use of a quality management system that has been confirmed by the TÜV CERT certification institute.